The National Catholic Reporter provides us with the latest controversy about historic art and how it depicts Manifest Destiny and the Doctrine of Discovery. The article is headlined: Offensive murals must go, say Native American Notre Dame students and others — But administration says paintings of Columbus will stay. But lining the walls of the second floor’s main hallway are 11-foot murals that send the wrong message about Notre Dame, say more than 450 students, faculty, staff and alumni who have signed an open letter to the university president urging their removal. 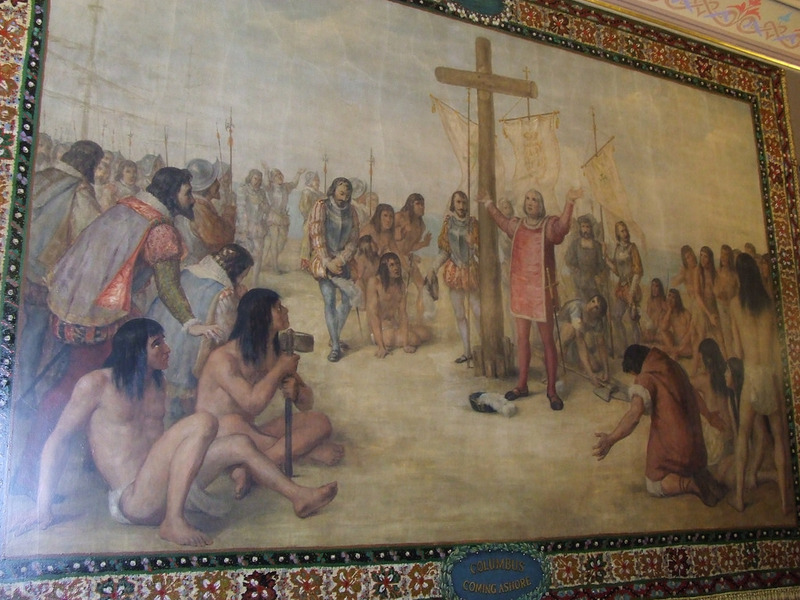 The 12 Renaissance-style murals, painted from 1882 to 1884 by Vatican portrait artist Luigi Gregori, depict and celebrate Christopher Columbus, who at that time was seen as something of “American saint,” according to a pamphlet produced by University Communications. The arguments on both sides will be familiar to anyone who followed the debate about the art in the Minnesota State Capitol. The university says murals “are of historic and artistic value,” and they will stay in place.